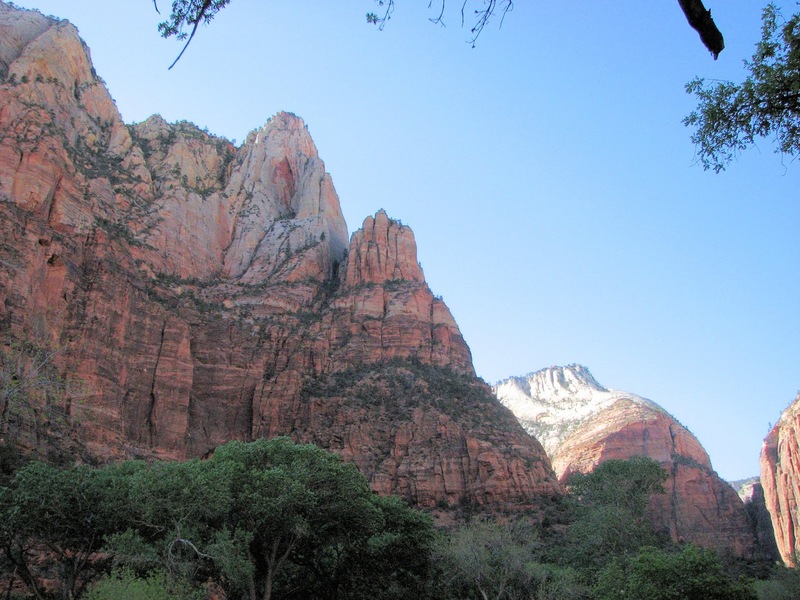 These photos of Zion National Park were taken on April 16, 2007. 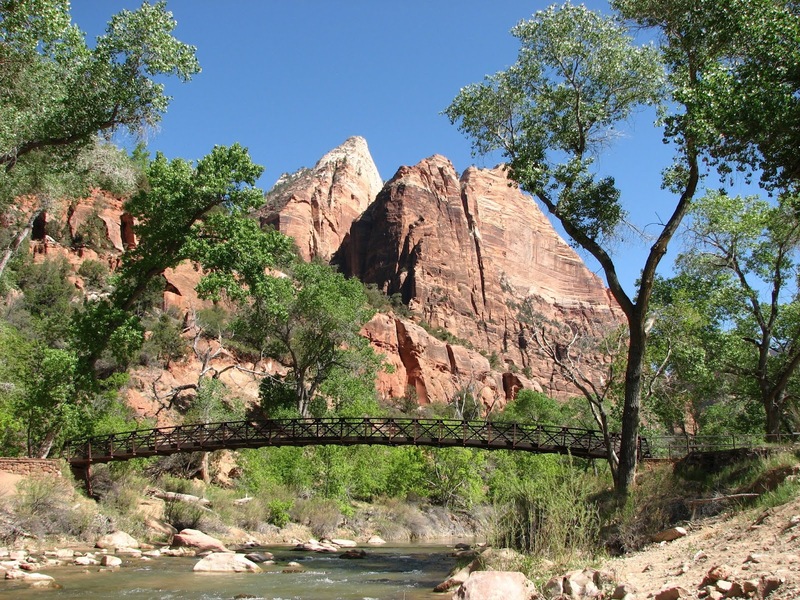 Spectacular cliffs and the lush Virgin River as it meanders through Zion Canyon are the main features of Zion National Park. Zion Canyon Scenic Drive runs through the lower portion of the canyon. The road is closed to most private vehicles spring through fall. 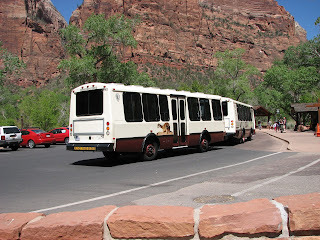 Free shuttle buses run up and down the canyon. At the time of our visit they used these double buses consisting of a main bus towing a passenger trailer. In the trailer you got a bit of whip-lash accelerating out of the corners. For young kids the buses may be the most fun experience in the park! 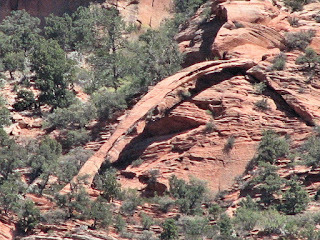 Telephoto shot of Crawford Arch. Behind the Zion Human History Museum is Oak Creek Canyon. This is where most of the ranger residences are located. One of the residential buildings in the group above. 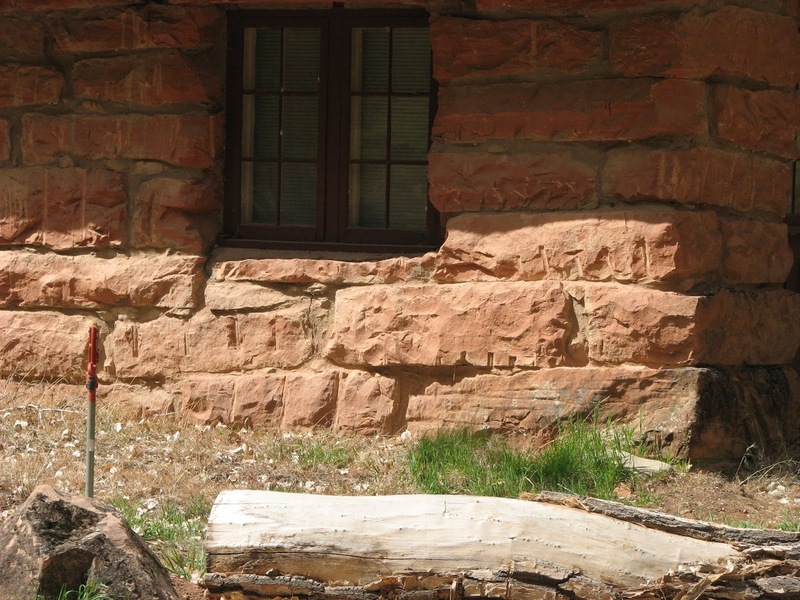 One of the best ways to identify the historic buildings is to look for the stone foundations on them. Most of the newer buildings have concrete foundations. 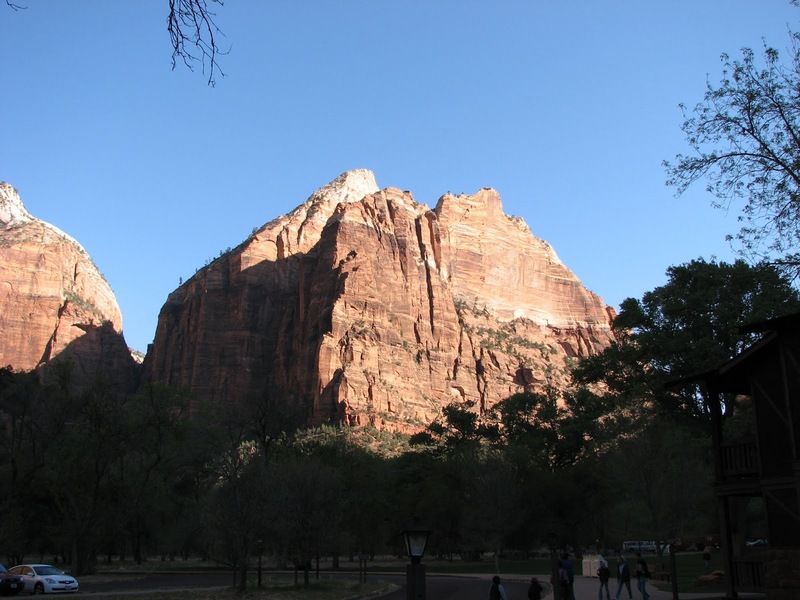 This group of peaks are called the Court of the Patriarchs. About half way up the Zion Canyon you come to the Zion Lodge. Zion Lodge is the only full-service guest facilities (food, store, lodging) inside the park. 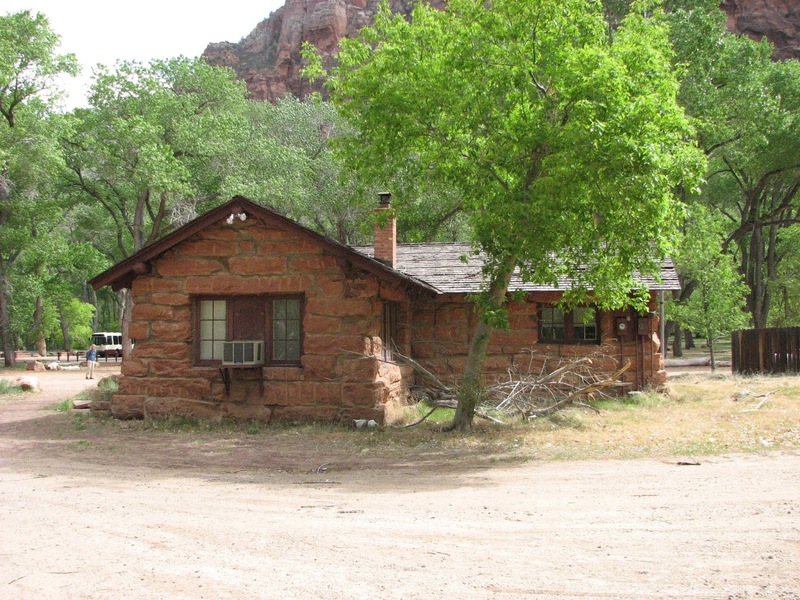 The original Zion Lodge was built in 1924 and burned to the ground in 1966. This is a replacement building, built in 1966. 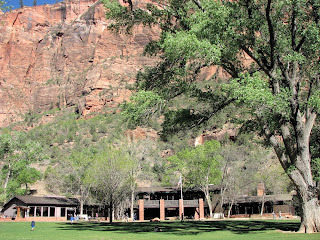 This building contains a snack shop & gift shop on the left side, as viewed in the photo above. An outdoor patio for the snack shop is just out of the photo to the left side. The hotel lobby is in the middle of the building; an auditorium is on the right side. Upstairs above the lobby is The Red Rock Grill Dining Room & Lounge, featuring a large 2nd floor outdoor dining balcony (look for the balcony railing directly behind the flagpole). All that remains of the original lodge is the fireplace in the auditorium of this new building. However many of the cabins here at Zion Lodge are fully restored historic buildings from the twenties. 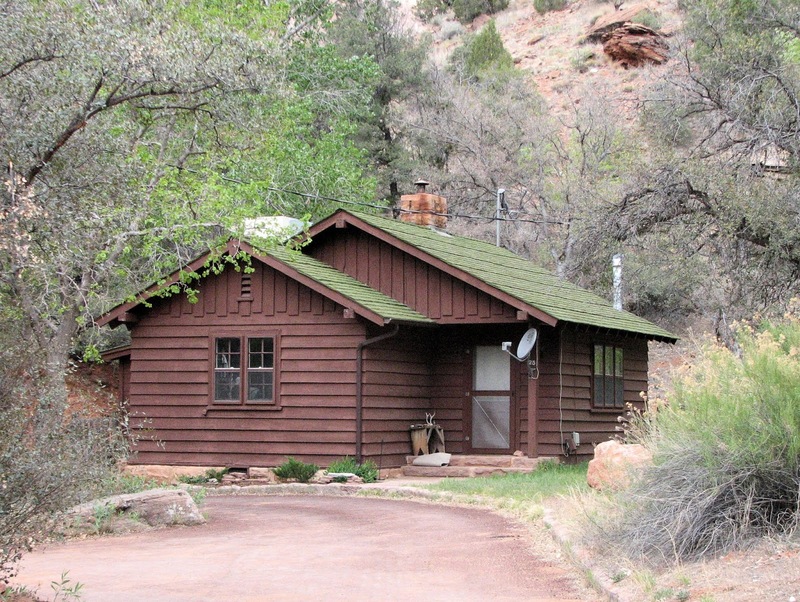 The cabins are a nice combination of old architecture and modern upgrades. As you may have guessed I am fond of historic architecture. I have an in-depth web-page on the Architecture of the Zion Lodge including lots of photos and historic details. I hope you'll take a look at it. 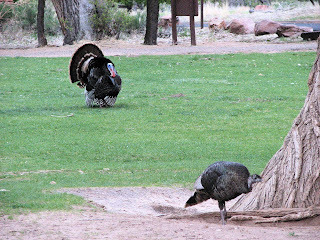 Wild turkeys courting on the lawn in front of the Zion Lodge. 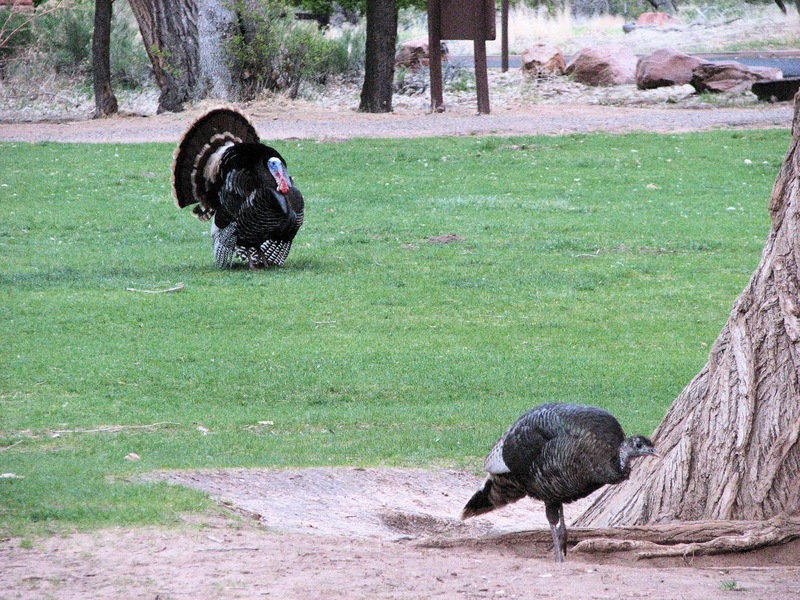 There often are turkeys wandering around the Lodge area enjoying the lawns. Another view of Lady Mountain from further up the canyon. From the Zion Lodge parking lot a trail leads across this bridge, from there a short walk takes you to the Emerald Pools at the base of a side canyon. Green moss and small plants create what are called hanging gardens in areas where water seeps from the rock walls of the canyon. This isn't the best one, there are others that are more lush. 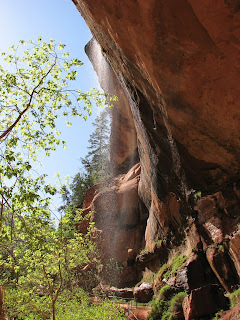 This small waterfall drops into the pools. 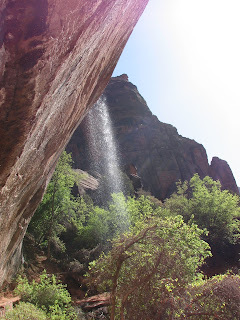 The trail leads behind the waterfall where you can feel the mist fall on you. 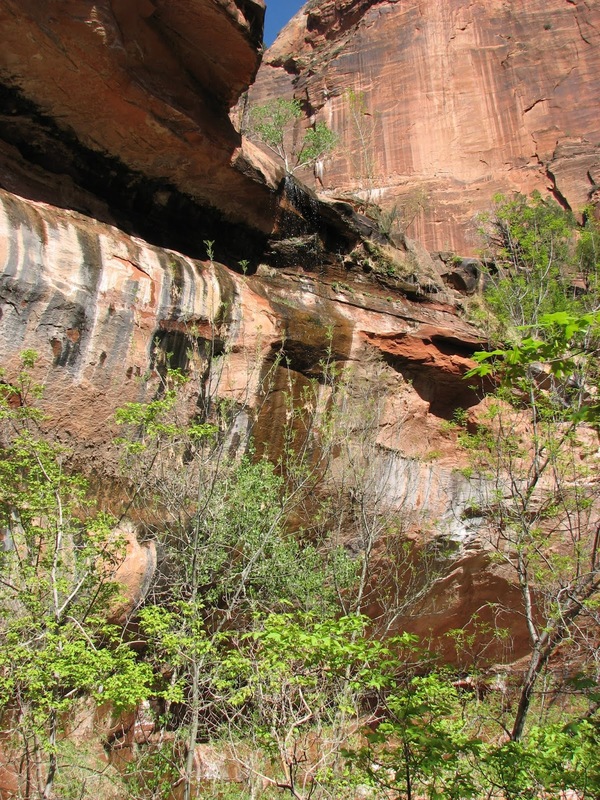 Ground water that is full of dissolved minerals seeps from cracks in the rocks on the sides of the canyon walls above the pools. 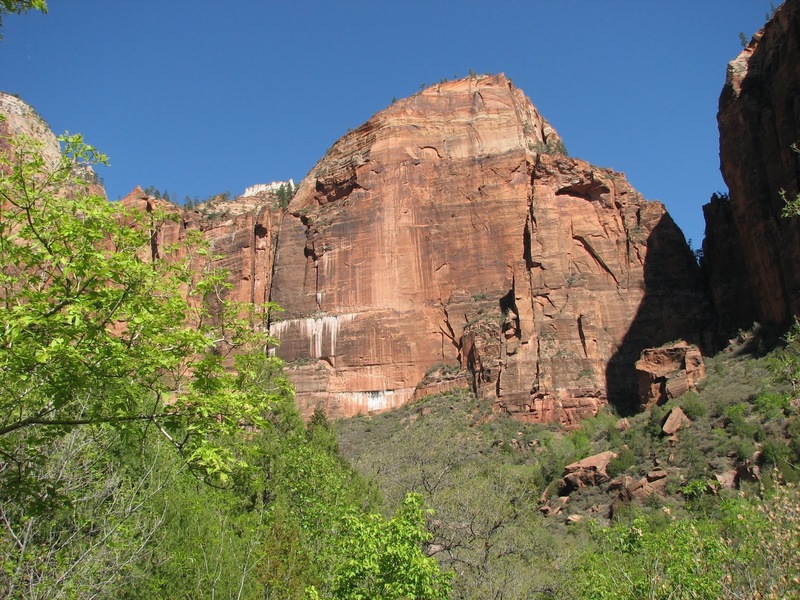 Note that the white mineral stains are only located below major fissures in the rock. 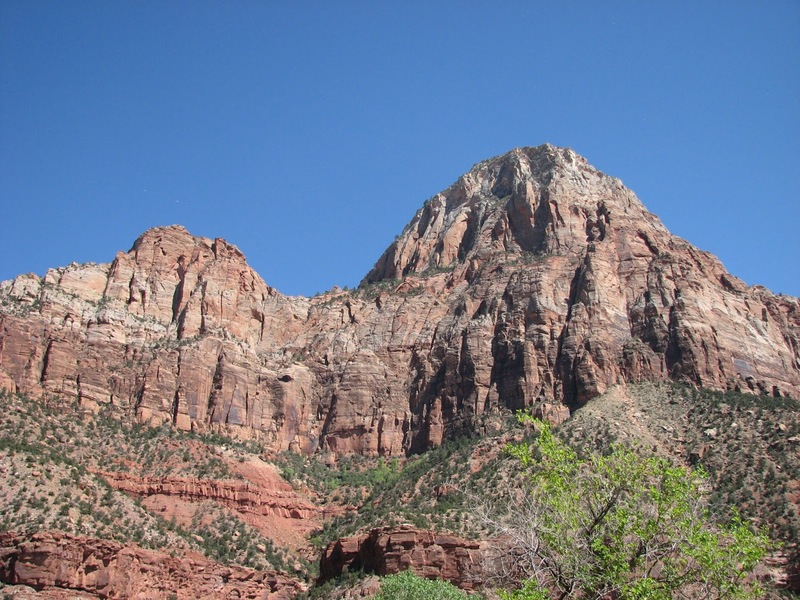 This is Mount Majestic. Emerald Pools is located in Heaps Canyon on the left side of Mount Majestic. 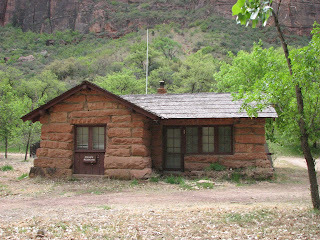 This building was the original Zion Museum. 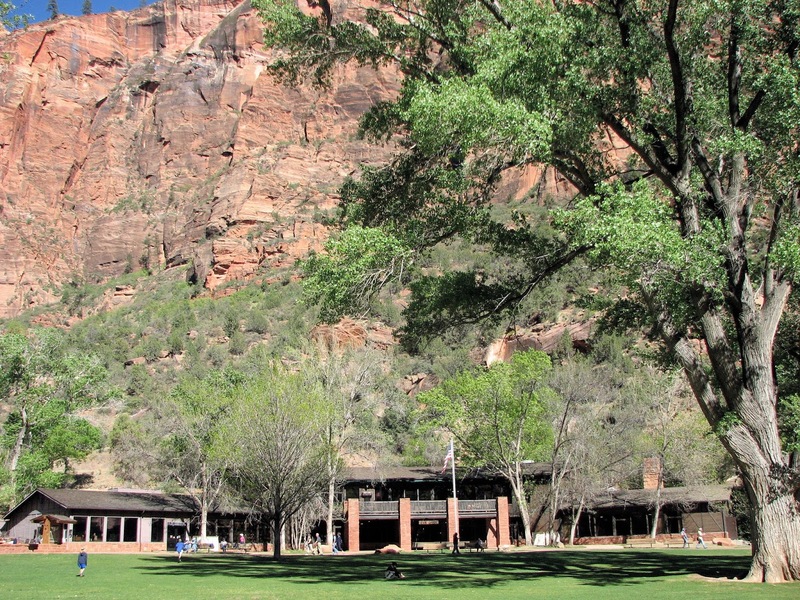 The Grotto area was originally the park campground, it is now a day-use picnic area. 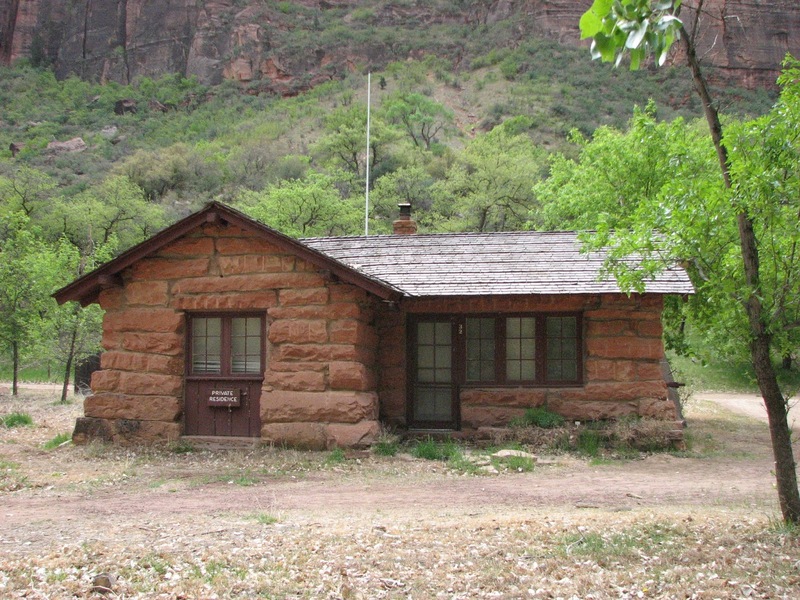 The Zion Museum building is now a Ranger residence. 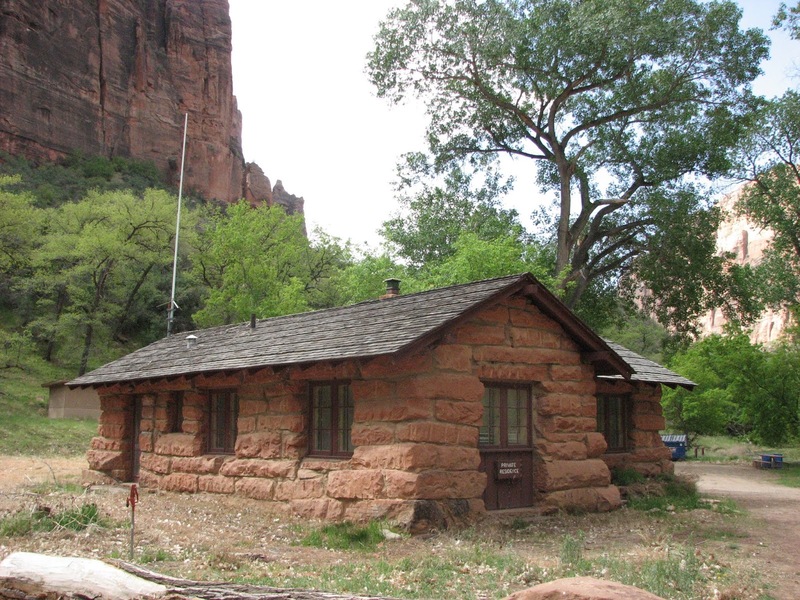 The Zion Museum Building is the oldest building in the Park. 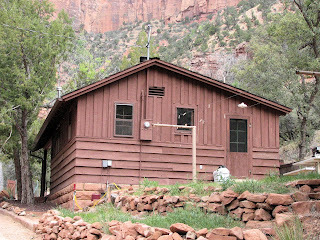 Notice the tool marks on the rocks on the Zion Museum building in the photo above. You can date the rock work in the park by looking for tool marks. 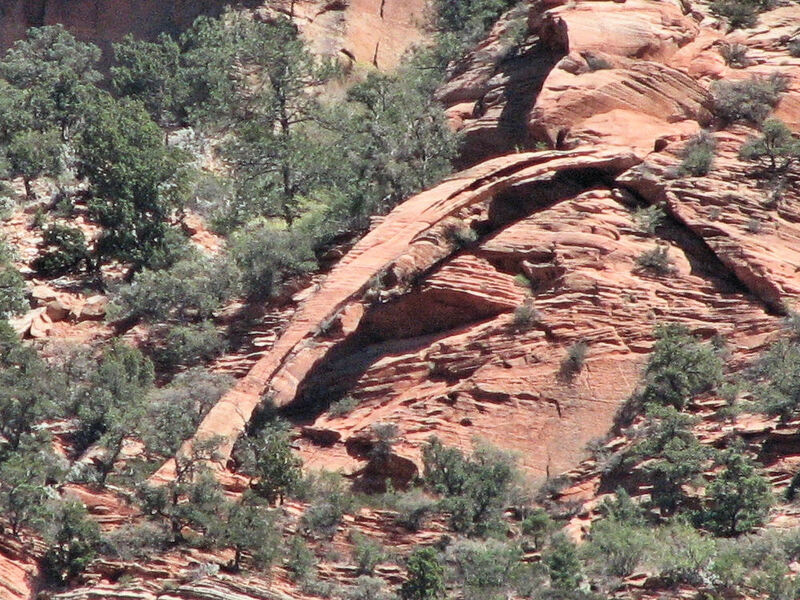 The older rock work is more rustic and often has tool marks on the surface. 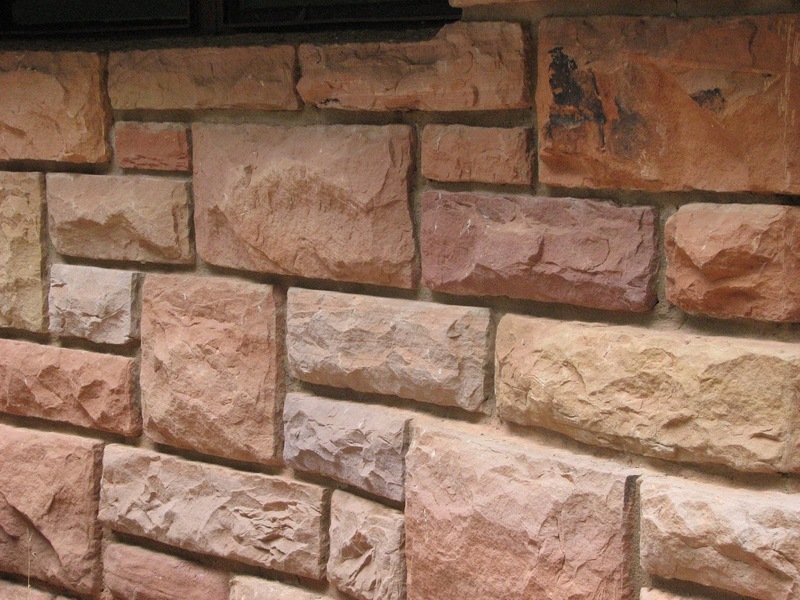 Now look at rock work in the photo below. Shown below is a nearby restroom building. 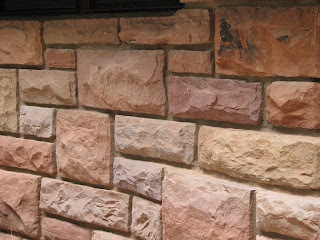 The restroom building was constructed later, using a much more formal rock pattern. This rock cliff is called the Great White Throne. 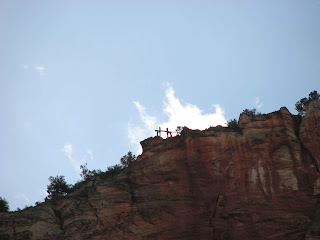 This is Angel's Landing and is one of the more famous cliffs in the park. 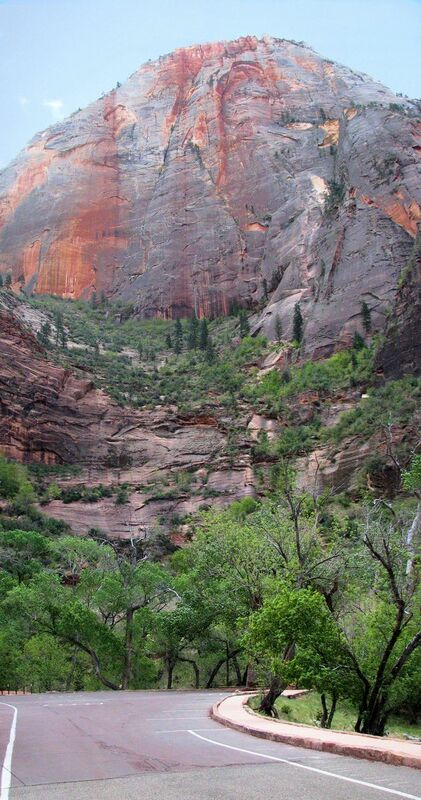 The trail in the foreground leads to the top of Angel's Landing. The trail is famous for it's shear drop offs and steep switchbacks-- you will need nerves of steel and lots of energy to get to the top of Angel's Landing! The trees along the river in the bottom of the canyon are beautiful, but poorly suited for construction lumber. 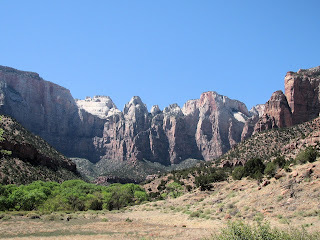 Nearby at the top of the canyon there are plenty of pine forests filled with great wood. 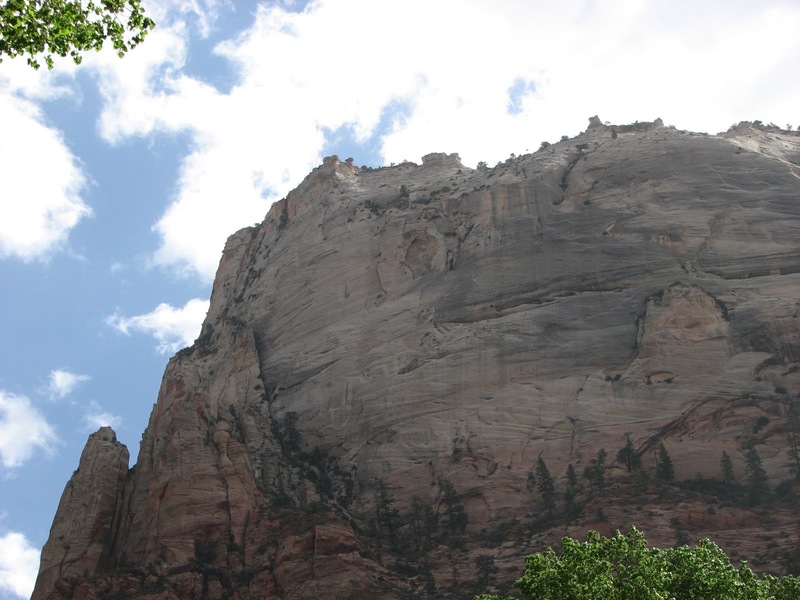 The problem is getting the wood from the top down into the canyon where it could be used for construction of tourist facilities. The solution was the Cable Mountain Draw Works, an aerial cargo tram that went from the rim down into the canyon. 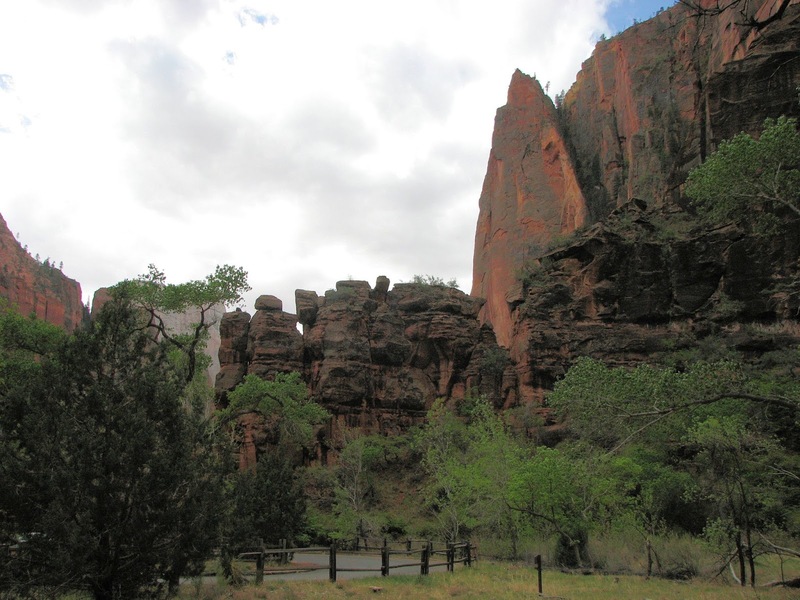 The draw works was the brainchild of a man named David Flanigan, and after 2 years of planning and tests, it started hauling lumber down into the canyon in 1901. 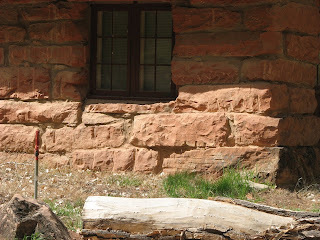 A sawmill was built at Stave Spring near the top of the tram to supply cut lumber. 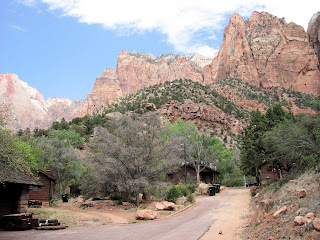 Wood for many of the historic buildings in the park came down into the canyon on the draw works. 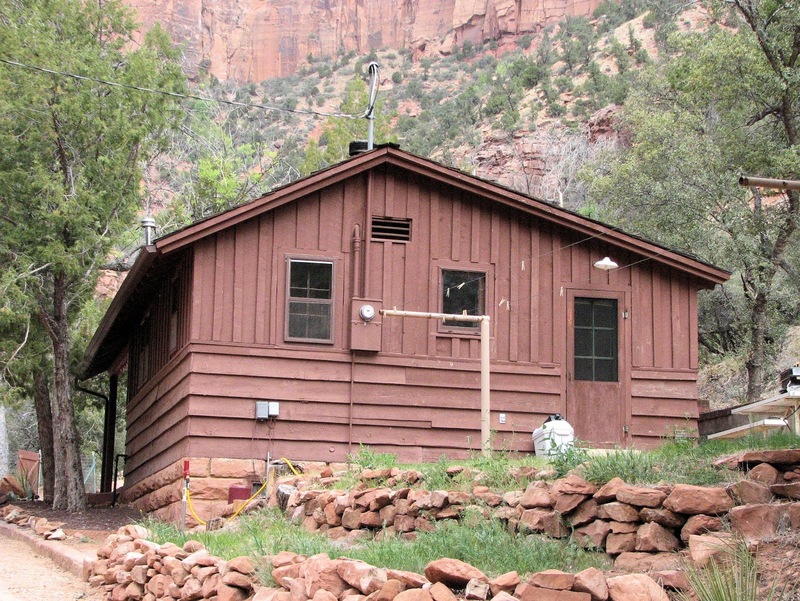 One of the last uses of the draw works was to deliver lumber for the original Zion Lodge building. By 1925 most of the good lumber had been cut from the area around the top of the draw works and it fell into disuse. The park service removed the cable in 1930 and later removed the lower cable station, but the wooden top cable supports are still visible at the top of the cliff. The ruins of the upper draw works cable support tower can be seen on top of Cable Mountain. Cable Mountain. 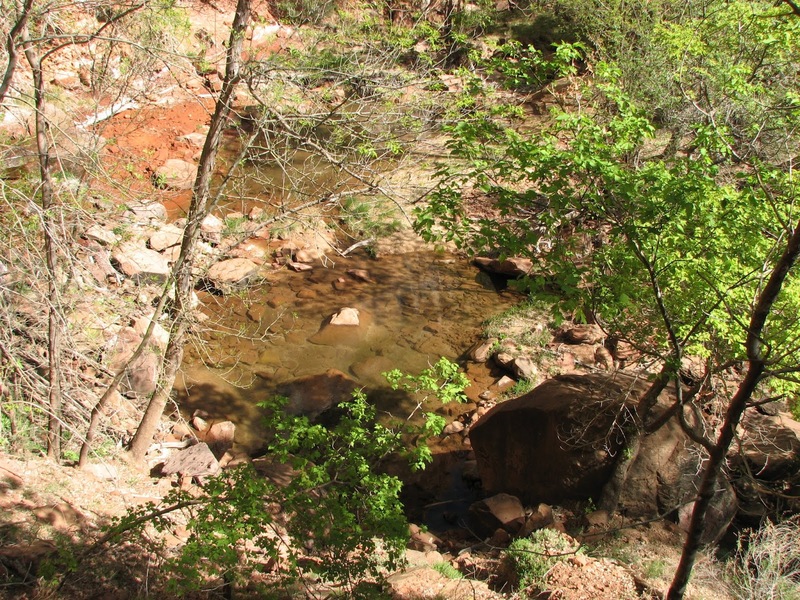 The lower station of the Cable Mountain Draw Works ended in what is now a parking lot. 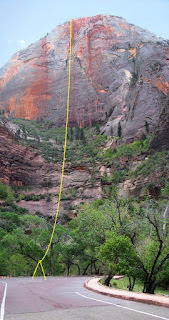 I drew a yellow cable into the right photo to show the cable location. This table topped outcrop across the river from the end of the road is called the pulpit. 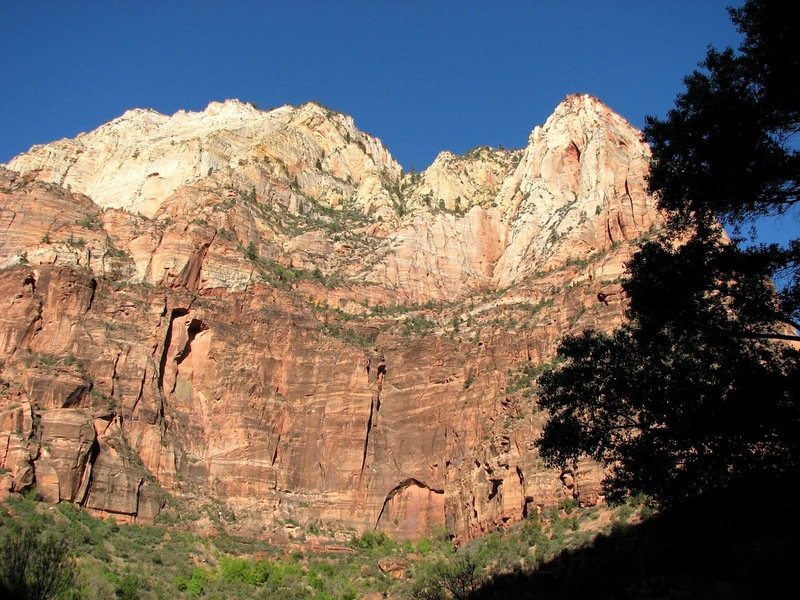 The outcrop in this photo is called the Temple of Sinawava. It towers over the shuttle bus stop at the end of the road. 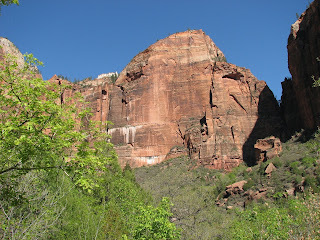 From here the canyon narrows with only room for a trail. 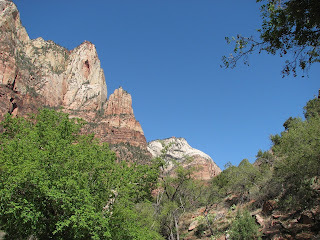 The Riverside Walk trail goes from here 1 mile up the canyon to the start of a "slot canyon" called The Narrows. 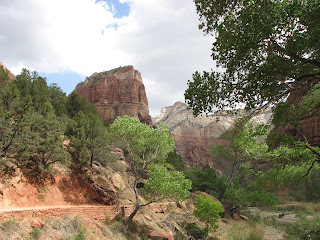 At The Narrows the canyon becomes too narrow for even a trail. At that point you must hike through the water in the river to continue upstream. 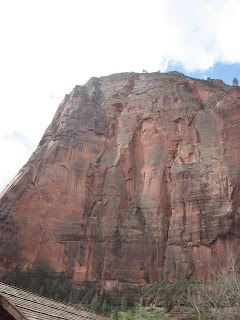 We didn't walk up to The Narrows on this trip.